Hilton HHonors just announced their Q2/Q3 2014 promotion that is called “Double Your HHonors”. You can earn double points or airline miles for stays between May 1 and July 31, 2014, at properties that haven’t opted out 600+ (opt our property list here). You can access and register for this offer here and read the frequently asked question by Hilton here. Note that you must decide between double points OR airline miles. The non-participating hotel list (access here) is REALLY long. More than 600 properties have decided not to participate and around 580 of those are in the United States. The Double Airline miles option makes really no sense under the devalued airline double dip program. You should choose double points instead. 10 Hilton HHonors points per USD spent at full service properties are far more valuable than one extra airline mile. Offer valid for eligible stays completed between May 1 and July 31, 2014 (“Promotion Period”) at any participating hotel in the Hilton Worldwide portfolio (click here for hotels who have chosen to not participate). Hilton HHonors™ members must first register at HHonors.com/Double prior to check-out of your first stay within the Promotion Period. Your selection of Double Points or Double Miles applies to all eligible stays completed during the Promotion Period at participating hotels and cannot be changed. Registered HHonors members will receive the selected bonus only for nights completed during the Promotion Period, regardless of a check-in date before the Promotion Period begins or a check-out date after the Promotion Period ends. 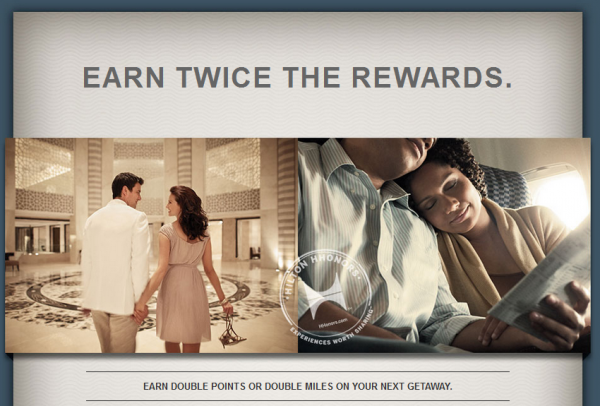 If registering for Double Miles, you must select Points and Miles as your Double Dip™ Earning Style within your HHonors profile. “Double Points” means you will receive a bonus equal to the number of Base Points earned during a stay. Bonus Points earned on Base Points do not count toward tier qualification. Double Miles are available only with participating airlines. A preferred airline must be selected in your HHonors profile. Airline Miles accrued and awards issued are subject to the Terms and Conditions of each participating airline’s reward program, as applicable. Certain airlines may not participate with the brand at which your stay is consumed. For details on the eligibility of your stay to earn miles, please click here. Please allow six to eight weeks from completion of your stay for points or miles to appear in your HHonors account. Offer is not transferable, is not valid for groups and cannot be combined with other select offers. What is the name of the Hilton HHonors™ promotion? HHonors members can register to earn either Double Points or Double Miles for all eligible stays during the Promotion Period. What is the Promotion Period for the ‘Double Your HHonors’ promotion? “Double Points” means you will receive a bonus equal to the number of Base Points earned during an eligible stay. Do I have to change my MyWay™ Earnings Style Option in my HHonors account in order to receive Double Points for this promotion? No. However, to maximize the number of points you can earn during the promotion, selecting HHonors Points & Points would be best. What does Double Miles mean? “Double Miles” means you will receive a bonus equal to the number of base miles earned during an eligible stay. How many base miles do I earn? For most travel partners this is one mile per eligible US dollar spent, some travel partners offer different mile amounts per eligible US dollar spent — see travel partners for details. Limited to up to 100 miles per stay at Home2 Suites by Hilton™. Do I have to change my MyWay™ Earnings Style Option in my HHonors account in order to receive Double Miles for this promotion? Yes. You must change your profile to Points & Miles in order to earn miles. You must also have a preferred airline selected in your HHonors profile. Double Miles are only available with participating airlines. Click here for a list of participating airlines. How do I change my MyWay™ Earnings Style Option in my HHonors account in order to receive Double Miles for this promotion? Will I still earn the Double Your HHonors promotion bonus if I select Double Miles but I do not have Points & Miles selected for my MyWay™ Earning Style Option? No. If you do not have Points & Miles selected as your MyWay™ Earning Style Option you will not earn a bonus for the Double Your HHonors offer. What is the maximum number of points I can earn? Standard HHonors program Terms and Conditions apply. HHonors members can access our registration page through www.HHonors.com/Double. Yes. HHonors members must register for the promotion at www.HHonors.com/Double. Yes. You can join the HHonors program for free, register for the promotion and immediately be eligible to participate. Simply visitwww.HHonors.com/Double and follow the steps to join HHonors and register for the promotion simultaneously. After registering, be sure to log into your HHonors account and on the right-hand side select ‘Preferences’. Update your MyWay™ Earning Style option to match the choice you made for the promotion. If you selected Double Miles – select Points & Miles and enter your preferred travel partner information (please note, you must complete this step in order to earn Double Miles for this promotion). The full Terms and Conditions can be found at www.HHonors.com/Double. All Hilton Worldwide brands are participating in the promotion: Conrad Hotels & Resorts, Waldorf Astoria Hotels & Resorts, Hilton Hotels & Resorts, Embassy Suites, DoubleTree by Hilton, Hilton Grand Vacations, Hilton Garden Inn, Homewood Suites by Hilton, Home2 Suites and Hampton. However, some hotels have chosen not to participate, you can view the list of non-participating hotels by visitingwww.HHonors.com/Double. Yes, as long as the member is registered for the promotion prior to check-out of the stay and the reservation is for an eligible stay then regardless of when a reservation was booked, any nights within the Promotion Period will receive the promotion bonus. Click here to read about eligible stays. If I check-in before May 1, 2014 or check-out after July 31, 2014, do I still earn credit for that stay? I registered for the wrong offer in the promotion, can I change it? No. Unfortunately, due to our system functionality; your selection at the time of registering is final. Any changes made by our Customer Service center could be reversed back to your original selection. We ask that you choose carefully. Will I receive Double Points or Double Miles for any stays within the Promotion Period that I completed PRIOR to registering for the promotion? No. Only members registered at the time of check-out will receive either Double Points or Double Miles for eligible stays within the Promotion Period. Members who select “Double Points” may earn Double Points (not miles) for incidental charges at participating hotels within the Hilton Worldwide portfolio during a Reward Stay, provided such charges are deemed eligible folio charges, this does not apply to incidental charges for stays at Hampton, Home2 Suites or Homewood Suites. For a complete explanation see Accrual of Points within the HHonors Terms & Conditions by clicking here. If you have more questions about the Double Your HHonors promotion, please feel free to contact us at 800-548-8690. Outside the United Stated and Canada, please dial + 800 44 45 86 67.